Clan Shatter-Shield Office is a small office in Windhelm that is home to Clan Shatter-Shield's shipping operations. 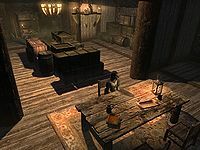 The office is located on Windhelm's docks, between the Argonian Assemblage and the East Empire Company regional office. It contains one interior zone: Clan Shatter-Shield Office. Rise in the East: Help the East Empire Company take care of some pirates. The building is a busy shipping hub run by the Shatter-Shields' employee, Suvaris Atheron. There is a long wooden table and three chairs holding a copy of Thief of Virtue, right in front of the entrance, with several empty carts to the east and west. The middle section is full of crates and the rear section has a round wooden table and chair, with the business ledger, a level locked non-respawning strongbox containing random items, a bottle of Nord mead, a small coin purse and an important clue required for the relevant quest - Suvaris's logbook on the table to the west. An unlocked respawning chest (which is empty) to the east and to the north are a set of shelves directly opposite the entrance holding copies of a rare book Of Fjori and Holgeir--(see notes), Beggar Prince, Antecedants of Dwemer Law, Report: Disaster at Ionith and The Wolf Queen, v5 as well as a bottle of alto wine, with a large pile of food sacks on and in front of the shelves. The rare book Of Fjori and Holgeir, relates to the quest Ansilvund. None of the sacks in the house are Respawning, so they are safe to store items in.